RCHC Choir (left to right) Ella Jabalamel, Madeline Gambon, Adalyn Kent, Audrey Kent, Brooke Smith, Madison Hernandez, Danica Updike, Zoe Lebrilla, Megan Hall. Sunday, May 7 at 3:00 pm at First United Methodist Church of Ventura, 1338 E Santa Clara Street, Ventura. Friday, May 12 at 7:00 pm at Rancho Campana Performing Arts Center, at 4235 Mar Vista Dr, Camarillo. 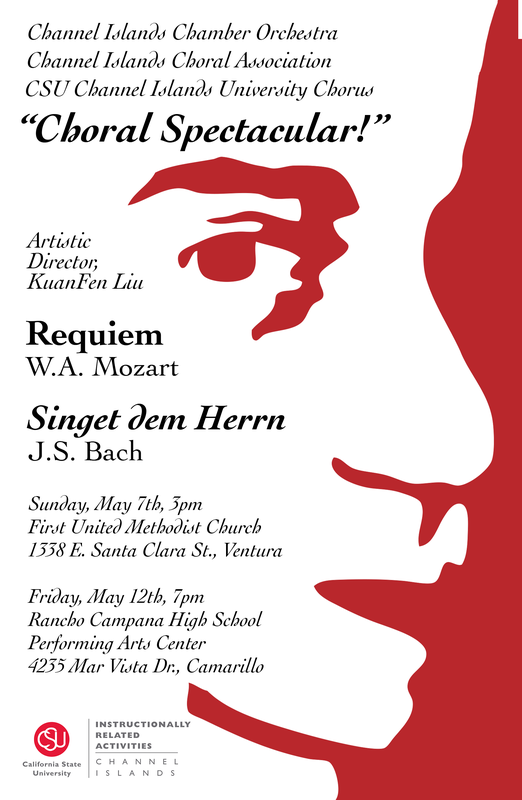 CSU Channel Islands Choir joined CHICO in a performance of Mozart’s Requiem Mass and Bach’s Motet Singet dem Herrn. Sopranos Jennifer Baker, Noemi Castañeda, Melissa E. Cohen, Beth Cook, Sandy Danielson, Sharon Hillbrant, Julie Lewis (section leader), Merilee McHenry, Molly Kohler Pei, Joan Luoto Rust, Teagan Walsh, Lissa White. Altos Jeehan Abdullah, Lauren Alvarado, Maureen Archer, Wendi Butler, Valerie Caulk, Glenda Clift, Loni Kate English, Ria Fidler, Denise Garcia, Kaitlin Gerds, Barbara Ghosh, Sidra Ginzburg, Renata Hundley, Stephanie Llamas, Stephanie Mamonova, Cee Cee Mills, Editha Pableo (section leader), Elizabeth Rossbacher, Kathy Walker. Tenors Auddy Anilao II, Dean Butler, Steve Harbison, Tyler Kimball, Michael Mayer (section leader), Bill Milton Jr., James Newton, Jackson Sauthoff, Josiah Shelton. Bass David Benjamin, Skylar Covich, Kenneth Day, Bruce Englar, Robert Johnstone, Bruce Markovich, Quint Morris, Christopher Ringor, Ken Saum, Ivar Tombach (choir manager), James Voiro. Vocal soloists are Dean Butler, Amanda Benjamin, Molly Kohler Pei and Zachary Mendez.